Like herniated discs, a slipped disc is just as painful to one's back. So what is a slipped disc? To start, a disc is a protective pad located between the bones (or vertebrae) of the spine. A slipped disc doesn't ever actually slip, but in effect, can rupture and spill out a liquid that dries out the disc and "deflates" the disc into a useless piece of tissue. This fluid from inside the disc then flows out and can put pressure on the spinal cord itself or on a nerve fiber, which can cause dull aching pains or severe, sharp pains up and down the back. 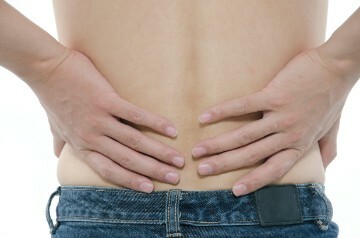 Sciatica is often a side effect of a slipped disc. There are many ways to "slip a disc" that include aging, injury from improper lifting techniques, sudden twisting or turning and excessive strain from physical activities. In many cases, a person can cause a disc to slip from being in a car accident where the back may suddenly twist and turn and cause undue pain. If you feel back pain, consult your chiropractor - he or she can easily diagnose the issue and can refer you to a surgeon or may create a treatment to fix the issue themselves without having to include costly spine fusion surgeries and the taking of pain medications which may or may not aid in the healing of the disc. Chiropractors check to see if there is a loss of muscle strength or a loss of sensation in an area that may supply information regarding motor skills and sensory commands. If the area near the slipped disc is not receiving information sent by those nerves, it may mean that the slipped disc caused a nerve to be pinched and may be harming the body more than helping it.